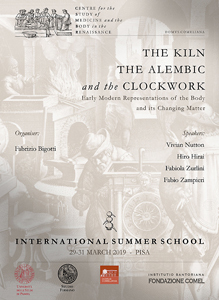 It is a pleasure to announce you that the CSMBR will be holding this year an International Summer School titled THE KILN, THE ALEMBIC, AND THE CLOCKWORK. Early Modern Representations of the Body and its Changing Matter – (Domvs Comeliana 29-31 March 2019) which will be running along with the 2018 SANTORIO FELLOWSHIP FOR MEDICAL HUMANITIES AND SCIENCE to be awarded to 5 MA or PhDs students. Fellowships are worth of 500 euros each. Should any of you be interested in joining the event as speakers or in any other way, please let us know. CENTRE FOR THE STUDY OF MEDICINE AND THE BODY IN THE RENAISSANCE (CSMBR).